So I was looking this up online and I could find pillow tutorials with a couple of these features but not all three. I took some time to figure it out and now I'm going to show you how I did it! Just one note, I did it with 1. a regular zipper and 2. a regular zipper foot. It's also put together with materials I had already. So there are other ways to do it, such as with an invisible zipper, but in the end I was really happy with the results. First of all, the fabric. I had a beautiful end piece of hand printed chintz that I found at the Textile Museum Sale. 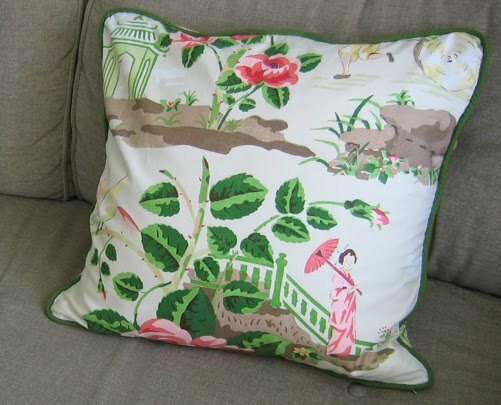 It's a gorgeous 1920s Scalamandre pictorial print called China Rose, and there was actually just enough to make two large covers, the same size as the existing cushions I had on the couch. Here's my trick for cutting out matching cushions with a pictorial print. 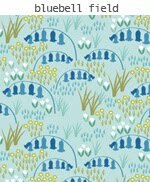 Arrange the two halves of fabric so that the print is aligned then cut out two matching front pieces and two matching back pieces. 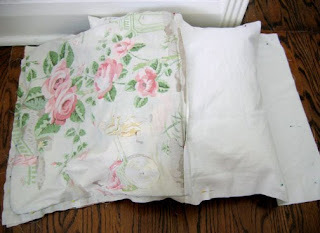 The front is different from the back on each pillow but the two pillows match. Just a nice little detail. 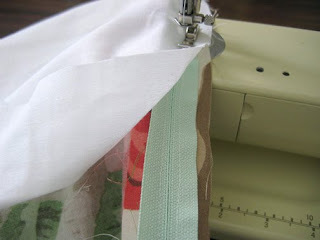 To make your piping cut narrow strips of fabric on the bias and use it to cover a length of cord. 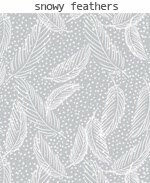 You can buy cord for piping by the yard at fabric stores. You can use ready-made bias tape to cover your cord, the same fabric as your cushion, or a contrasting solid or print fabric. 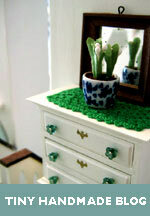 I used an olive green that matched the leaves in the print. 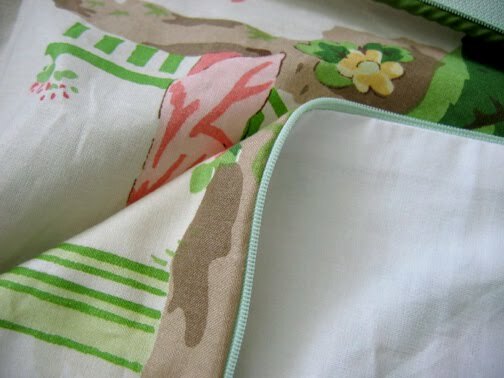 Despite the fact that this is a very nice fabric, it was a little bit thin for pillows. 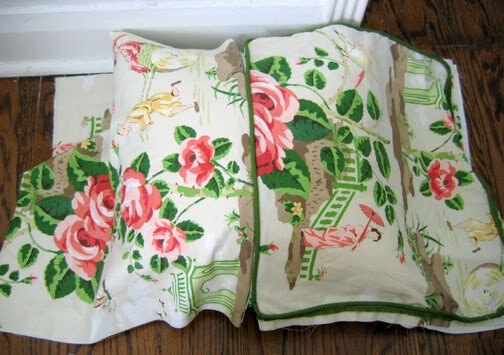 This means that without a lining the pillow wouldn't have a nice smooth luxurious look that does justice to the fabric. So I cut out two more squares of sturdy white cotton fabric for the linings. Now that you have all that prepared you're ready to put it together. STEP 1. 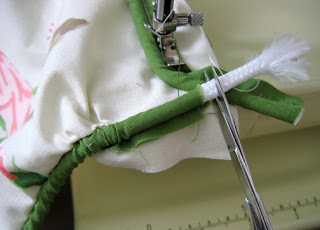 Using your zipper foot, attach the piping to the top side of the cushion. 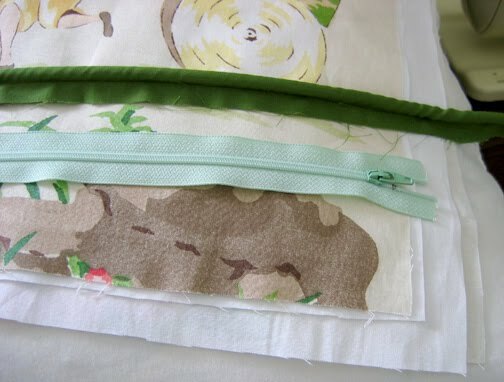 Snip 3 little cuts in the extra fabric of your piping so that you can bend it neatly at the corners. 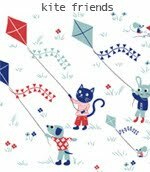 When you get to the end, pull the cord from one side out of its fabric casing a little bit, and trim the cord at an angle. Then open up the empty fabric casing and fold it over the other end of piping. It's hard to describe this but it makes a neat join without two thicknesses of cord overlapping. Don't do it right at the corner like I did, it's more difficult if you're working your way around the bend at the same time. I wasn't thinking ahead! STEP 2. 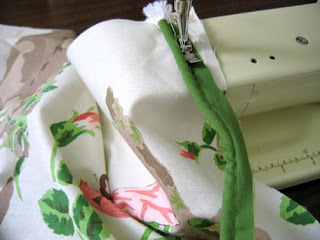 Attach the zipper to the bottom of the cushion (with an overall pattern it doesn't matter which side you attach it to). Place the zipper face down and open next to the piping and sew it as closely as you can to the piping. Close the zipper and sew it to the back of the cushion. At this point you can decide you've had enough and finish your cushion without a lining. 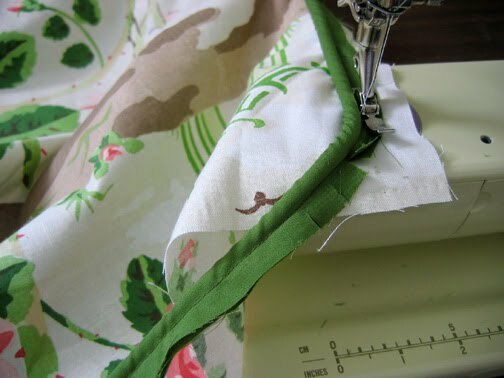 Just open your zipper up, pin the cushion right sides together, sew the three sides and you're done! 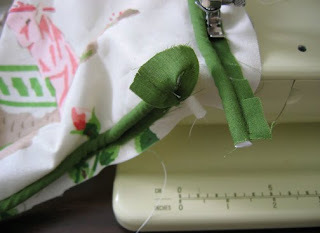 You can serge or pink the edges of the fabric so that they don't fray. If you don't have a serger and the fabric is really prone to fraying (such as a loosely woven wool) you can cover the edges with bias tape. Otherwise if you'd like a lining carry on to STEP 3. STEP 3. 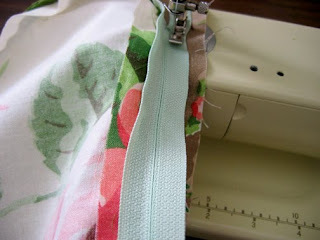 Attach the lining piece to the zipper. The zipper will be sandwiched between the lining and the outer fabric. 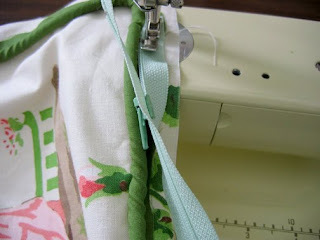 Pin it in place then open up to see if it's right before you sew. When the lining pieces are attached there should be nicely finished sides on both sides of the zipper - no raw edges showing. Repeat for the second lining piece. At this point I like to finger press the fabric next to the zipper so it doesn't get snagged when the zipper is opening and closing. So far you have only joined the lining on the zipper side. STEP 4. Align the cushion cover so that the the outside pieces are facing each other, right sides together, and the lining pieces are facing each other as well. Pin all around carefully. Make sure the zipper is open! STEP 5. Sew all the way around, but leave a 6" gap at the bottom of the lining. Remove the pins as you go. STEP 6. Trim the corners, then turn the cover right side out. 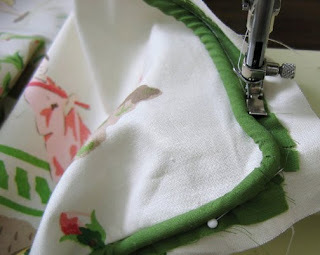 Hand or machine stitch the gap in the lining closed. Insert your pillow form and you're finished! You rock! 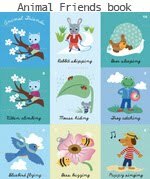 This is a great tutorial! I can't wait to try it when my new pillow forms get here. Wow, this is super detailed. Thanks for that. 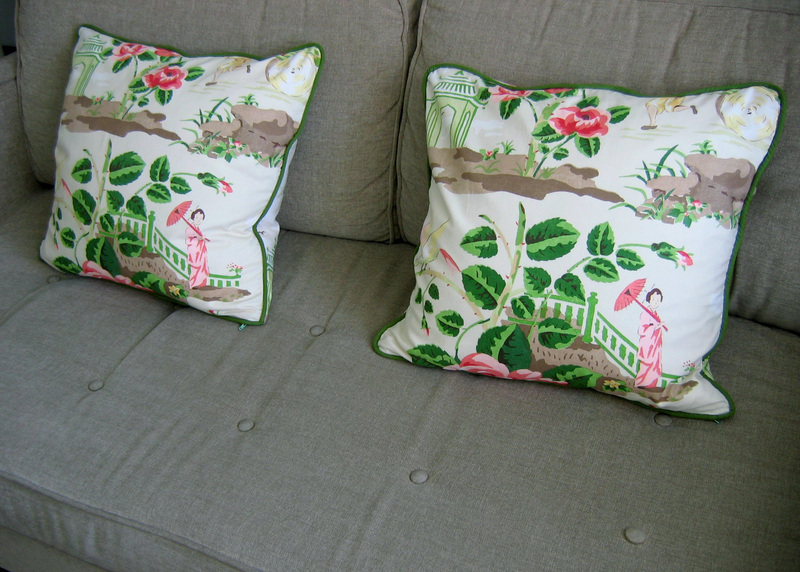 I've been meaning to make new pillow covers for my couch. I'm impressed. 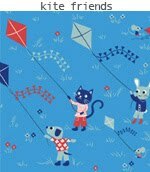 I want make a cushion with zipper and piping. Your tutorial it's really useful and very clear. Thank you so much! hi just wondering what do u use for the lining??? This is such a great tutorial Super clear and great photos. Thanks a lot, it will save me a lot of time. Thanks to your tutorial I will not have to repeat my afternoon of removing a zipper on a pillow I am in the process of making. After sewing it in all too securely, I discovered it was not laying properly along the cording trim. Ugg!! What a waste of time!! I have just successfully made a pillow with trim and zip for the first time ever after following your tutorial. I chose it from many as you made it clear and straightforward compared to others. Has given me the confidence and bug to do more. Huge thank you. Excellent instructions! 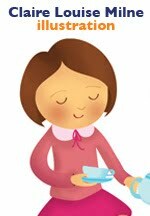 I've looked at a few demonstrations and they were quite poor, especially to a novice... really good, thank you very much! Whats the reason for not aligning the piping and pillow top raw edges? I'm guessing it has to do with the zipper? 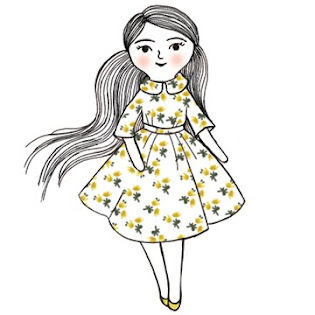 Still new to sewing so sorry if the answer is obvious!